Sri. K. Pattabhi Jois Ashtanga Yoga Institute (KPJAYI) which is located in Mysore, India, is the only recognized center for the teaching of Ashtanga Yoga in its traditional method. SharathJi (Sharath Jois), Director of the Institute and grandson of the late K. Pattabhi Jois, is the one who follows this parampara lineage that is more than 700 years old, and from which I have received the blessing with the Level 2 Authorization to teach and protect the method in its original state. The message of my teacher SharathJi and KPJAYI is to create small families and communities in our hometown, giving this gift that is Ashtanga Yoga to the next generation. 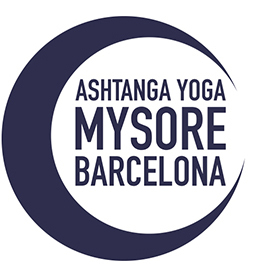 Mysore Barcelona is dedicated to the practice and practicioners of ashtanga yoga, a space of learning and human growth, to share, a place where we feel at home. You are all welcome! Catalan, from Barcelona. I studied Human Resources and worked for more than 10 years in personnel departments in public and private companies. After some time and after collaborating with NGOs in Peru and Nepal, I decided to change my life, and I went to live in Kathmandu. I spent 5 years living between India and Nepal, where I went deep in breathing and meditation techniques, but above all in the practice and study of Ashtanga Yoga. It was in Kathmandu that I made my first drop-in in an ashtanga class and from the first breaths I knew that this was what I was going to do for the rest of my life. I travel every year to Mysore, India, to study with my teacher SharathJi (Sharath Jois) in Sri. K Pattabhi Jois Ashtanga Yoga Institute KPJAYI, where I also studied with Saraswathi Jois, the first woman admitted to the Sanskrit College of Mysore, and where I have the opportunity to practice, learn and share shala with experienced and former students of this lineage every season. I have attended workshops of Ashtanga Yoga practitioners such as David Svenson, Peter Sanson, Ty Landrum, Manju Jois or John Scott. I have been teaching in different yoga centers and Mysore programs, and I collaborate regularly doing ashtanga yoga classes in companies. If you want to know more about me, come to MysoreBarcelona! !